This is the book nobody wants you to read. - From the Letter of John Conyers, Jr., Chairman of the Congressional Legislation and National Security Subcommittee of the Committee on Government Operations, to Warren Christopher, the U.S. Secretary of State, October 19, 1993. “I personally feel a strong common bond with this courageous man, recognizing that his motives are the same as those that led me to release the Pentagon Papers. “I was proud to add my voice to that of the many scientific and human rights organizations that have worked to free Dr. Mirzayanov. “…in recognition of his courage and his singular demonstration of the moral responsibility of individual scientists in uphold the integrity of scientific knowledge in an emerging democratic society”. The 1994 Heinz R. Pagels Human Rights of Scientific Award of The New York Academy of Sciences. - Signed by Chairman Cyril M. Harris and President Joshua Lederberg. - From the Text of the Award in June 1993. - From the Text of the 1995 AAAS Freedom and Responsibility Award. No wonder so many scientists at GOSNIIOKhT, stifled by party control and interference into their lives and bureaucratic lies, simply turned to the bottle for escape. Born in 1935 in a rural village in rural Bashkortstan, Russia, Vil Mirzayanov was the son of the village school teacher. His father, a staunch Communist, broke with a 200 year old family tradition in which the oldest sons entered the Muslim clergy. The Mirzayanov family is Tatar, a Turkic ethnic minority descended from the Bulgar Huns. Dr. Mirzayanov distinguished himself as a chemist, and over a 26 year period, he worked at the State Research Institute of Organic Chemistry and Technology in Moscow, which was the main developer of chemical weapons in Russia. As Chief of the Counterintelligence Department, he was responsible for developing methods of detecting extremely minute in the environment surrounding the institute. At some time during the 1980’s, Dr. Mirzayanov came to the conclusion that chemical weapons were unnecessary for his country’s defense, though dangerous for people near the manufacturing and storage sites. During perestroika, the CW program was going ahead at full speed, while President Gorbachev and others denied its existence. Dr. Mirzayanov tried to change things through the usual channels at his institute, but was rebuffed. In 1991, he published a short article in “Kuranty”, hinting at the CW program, but no one noticed, except for his employer and the KGB. He was fired from his job. In the fall of 1992 Dr. Mirzayanov gave an interview with “The Baltimore Sun” and co-authored an article in Moscow News. In October, he was arrested and sent to Lefortovo Prison charged with revealing state secrets. He never gave any formulae or protocols for synthesis of the super deadly new class of chemical agents he referred to, called “Novichok” or newcomer at that time. Though he was released 11 days later, he remained under house arrest until his trial in January 1994. The closed-door show trial attracted a great deal of international attention and the support of many scientists and human rights advocates all over the world. Dr. Mirzayanov was sent to “Matrosskaya Tishina”, a maximum security prison for a month, for refusing to participate in the “kangaroo court”. His case was eventually dropped, due to lack of evidence. After that, Dr. Mirzayanov became the first person in 70 years to sue the Russian government, including the Procurator General’s office, the KGB and his institute. He won a 30 million ruble award, which was later overturned by an appeals court. 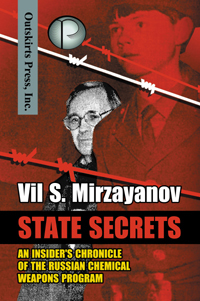 In 1995, Dr. Mirzayanov immigrated to the United States, and wrote this book about his life and experiences within the Soviet/Russian chemical military complex. It has been under edit and revision for a while. Finally, the story of Novichok has come forth. He has received the 1993 Cavallo Foundation Special Award for Moral Courage, the 1994 Heinz R. Pagels Human Rights of Scientists Award of the New York Academy of Sciences and the 1995 American Association for the Advancement of Science (A.A.A.S.) Scientific Freedom and Responsibility Award. Dr. Mirzayanov testified 1995 before the U.S. Senate Permanent Subcommittee on Investigations, which was holding a hearing about terrorism and the Aum Shinrikyo cult.